The Lord of the Rings the Fellow of the Ring Extended Edition Blu-ray Review. This release will keep all die hard fans happy of the Trilogy happy until the upcoming Peter Jackson’s The Hobbit: An Unexpected Journey movie! In the 60 or so years following its initial publication, J. R. R. Tolkien’s Lord of the Rings trilogy has proven immensely and unceasingly popular with readers all around the world. Combining its author’s love of linguistics, religion, mythology and epic poetry, Tolkien’s high fantasy masterwork undoubtedly stands as one of the great literary triumphs of the twentieth century, and to this day continues to inspire a variety of interpretations regarding its underlying themes and the motivations of its many colourful and expertly rendered characters. Despite the enduring popularity of the work and its precursor The Hobbit (1937) however, film adaptations appeared only sparingly and had only ever taken on an animated form, which while allowing costs to be kept to a manageable scale hardly did justice to the unparalleled scope and grandeur of the text. This all changed when director Peter Jackson signed on to bring all three works to the big screen. Jackson saw in his native New Zealand an oasis of contrasting landscapes and immense natural beauty that could convincingly conjure up the realm of Middle Earth. In a principal shoot that lasted almost fifteen months Jackson filmed all three works simultaneously, released them at yearly intervals to worldwide acclaim and enormous box office success. Nominated for thirteen Academy Awards, of which it took home four, The Fellowship of the Ring (2001) still stands as the most cogent and cohesive film of the trilogy. In this opening gambit, which of the three films also remains the most faithful adaptation of Tolkien’s original material, we are introduced to the Dark Lord Sauron and his quest to retrieve the One Ring which was stolen from him some three thousand years previous. A fellowship of dwarves, elves, humans and hobbits is formed in order to bring about the ring’s destruction, and once more deliver peace to Middle Earth. The powerful wizard Saruman (Christopher Lee) raises an immense army of orcs to defeat the party, who are beset by all manner of dangers on their path towards the fiery and foreboding Mount Doom, the heartland of Mordor and the decidedly hostile abode of the Dark Lord. Best of all, the extended version contains an additional 30 minutes of footage incorporated into the theatrical release of the film which although fleshes out the story even more, there's also plenty of cinematography of New Zealand. Some reviewers have commented that the special effects look a little dated, but there really isn’t too much evidence of that in The Fellowship of the Ring. Aside from the occasional lapse the CGI looks fantastic at a decade’s remove, and the Academy Award-winning costumes and makeup remain equally as impressive, particularly on the Ring Wraiths and Sauron’s fearsome orc army. The BD transfer is pristine, and picture quality remains crystal clear throughout. Compared to the previous Blu-ray release of The Lord of the Rings The Fellowship of the Ring, the extended edition is far far superior thanks to the five discs included in this purchase. For those purists who purchased the previous release, they will need to shill out even more money in order to get their hands on the hours upon hours of special features. 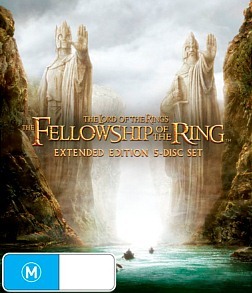 Some of the highlights included in the Extended Edition is separate commentary by Peter Jackson and Elijah Woods (to name a few), a very amusing MTV Movie spoof and some great appendices that link the original story to the modern film interpretation which also includes visual effects, filming techniques and sound. Similar to the Indiana Jones Blu-ray release, this collection collates as much special features as humanly possible to give us (for now), the definitive version of The Fellowship of the Ring in glorious FULL HD. This release will keep all die hard fans happy of the Trilogy happy until the upcoming Peter Jackson’s The Hobbit: An Unexpected Journey movie!